William Frazier Furr was born on July 10,1921 in Aberdeen, Mississippi. He was the eldest of the family consisting of father Esta and mother Lottie and their 4 sons William, Esta, Marion and Richard. William had an active childhood, participating in a wide variety of school, work, social, and recreational activities. He was voted Mr. Aberdeen High School and a most intellectual boy. Frazier graduated from high school at age 17 on May 29, 1939. Less than a month later, his father died on June 22. On September 18, 1939, Frazier began his freshman days at the University of Mississippi. He graduated on May 31, 1943 with a Bachelor of Arts degree. On June 5, 1943, he was awarded a Secondary Permanent Professional License to "teach for life in the Public High Schools of the State" of Mississippi. However, instead of answering the call to teach, Frazier answered the call of his country and enlisted in the United States Army. He entered active duty in August 1943 at Fort McPherson, Georgia, attended "mule handler" training at Camp Pickett, Virginia, and attended a Special Course in Infantry Weapons and Minor Tactics from November 14, 1943 to March 3, 1944 at Fort Benning, Georgia. After completing this training, Frazier rejoined his unit, Company D, 309th Infantry Regiment, 78th Infantry Division. (The Lightning Division). The 78th infantry division, "Lightning division" was established on the 27th of august 1917 in Camp Dix, NJ. After 9 months of training the division was transported to France in May 1918. 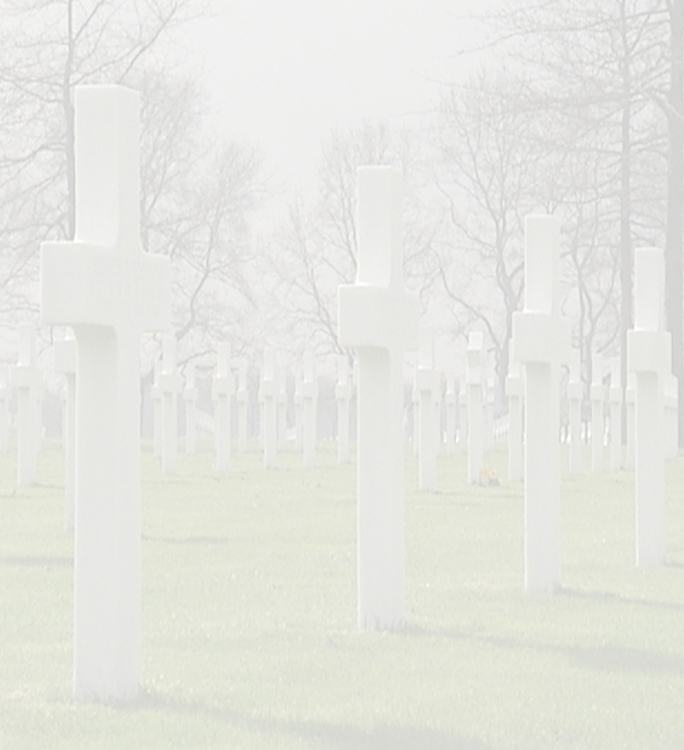 Here they fought in the Meuse-Argonne offensive that marked the end of the first world war. In this offensive it was the spearhead division. After WW1 the Lightning division was de-activated. On the 15th of August 1942 the 78th division was needed again to serve it's country. The division was activated in Camp Butner, NC. At first it was a training division, delivering over 60000 well trained soldiers to other divisions. From April 1944 the 78th division itself was preparing for combat. Early October they stayed a week in Camp Kilmer, from where they were shipped to Europe. After a stay in England the division went to France on 22 november 1944. It took a couple of days to reorganise before going to Belgium by box-car. On December 13th 1944 the Lightning division first saw combat at the battle for Hürtgenforrest. Later it fought in the battle of the Bulge, again Hürtgenforrest, Siegfriedline, Rurh, Rhine (Remagen) and the Rurh-pocket. After VE-day the 78th division stayed in Europe as an occupation force until the 22nd of May 1946. After WW2 the division was active as a trainingdivision and it saw combat again during operation Dessert Storm. The 309th first saw combat on December 13, 1944 as part of a major offensive to capture the Roer River dams near Schmidt, Germany. The unit’s first attack, north and east of Monschau, Germany, quickly resulted in a stalemate on December 15th. They held this position for the next month, during which time the Germans launched their Ardennes Offensive (Battle of the Bulge). The 309th's position lay close to the main supply route for the northern end of the German offensive. The 309th resumed the offensive in late January 1945. 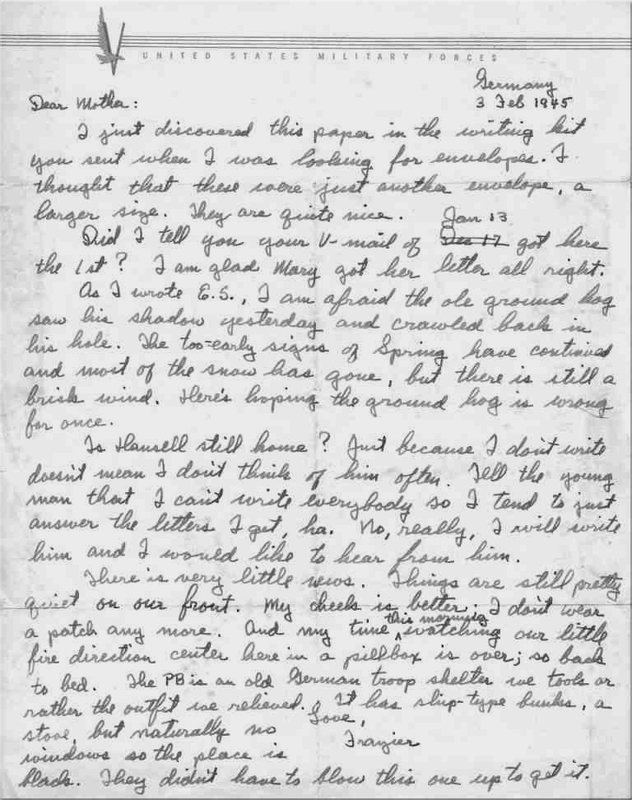 On February 1, Frazier wrote his mother declining her offer for underclothes ("not yet anyway"), inquiring about the activities of his brothers, and describing each member of his squad. On February 9th, the 309th was moved into the recently abandoned German positions at the edge of the great Schwammenauel dam. This position was subjected to intense artillery and mortar fire. On February 10th, Frazier was hit in the shoulder by a piece of shrapnel. He was treated by a medic but died on the way to an aid station. Schwammenauel lake seen from the north side. 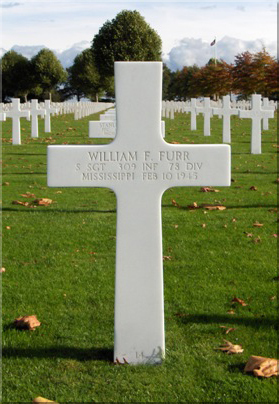 At 1:45 p.m. on February 11, 1945 Staff Sergeant William Frazier Furr was buried in grave #35, row 2, plot K, American Military Cemetery, Margraten, Holland. On February 24, 1945, his mother was notified of his death by Western Union telegram. 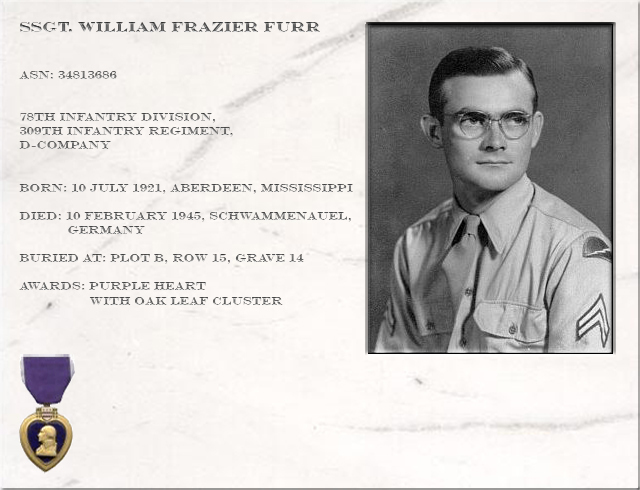 Nephew Bill Furr has set up a website about the Furr family and Frazier. He told us that at their last family reunion, they set a place at the table for uncle Frazier. Bill's full name is William Frazier Furr II, his son's William Frazier III, they hope to keep the name in the family for many more generations.